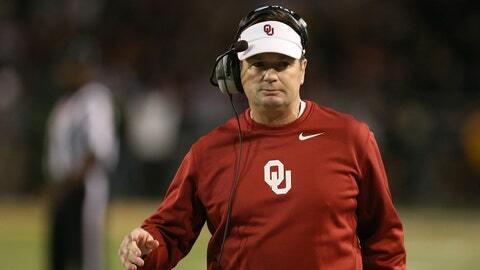 NORMAN, Okla. – Monday was the first day Bob Stoops and the Sooners met with the media. The Sugar Bowl is set for Jan. 2 vs. Alabama and by pretty much all accounts, Oklahoma is a massive underdog. That much, along with the 15.5 points the Tide is favored by, is information we already had a handle on. But here are three things we learned Monday from the Sooners and one thing to watch as the Sooners start game planning for their BCS game. 1. Please don’t ask the players if they are scared of Alabama. Well, asking if a player is scared is probably a bit ridiculous. No one would admit to that, but after some careful rephrasing, the question shouldn’t be whether the Sooners are scared, but more about whether they are in awe of a team that has been the best in college football for the better part of five seasons. Well, depending on how the game goes, this storyline could be revisited, but for now, the Sooners aren’t conceding anything to Alabama. And you thought you’d get an answer on this situation? Not likely. It’s been a lot of the same in that regard for the Sooners this season, so why change it up now? Stoops wouldn’t say who his starter will be, but he did say Trevor Knight was back at practice the past few days and was no affected by his injured shoulder. There are a lot of reasons to favor Knight over Bell when it comes to playing Alabama, as Knight is the more-accomplished runner and Alabama was recently burned in the running game by Auburn. Meanwhile, Oklahoma is a better running team than they are at passing. Of course, OU beat Oklahoma State a week ago, largely because of the passing game. Kendal Thompson came in after Knight was injured and threw it. And of course you know about the game’s final drive by OU where Bell led the team down the field, finishing it off with a 7-yard pass to Jalen Saunders. No one is suggesting OU has the rushing game Auburn does, but run game defense has been Alabama’s weakness. Run game offense has been OU’s strength. Stoops wouldn’t say who the starter will be, but count on Knight – if he’s fully healthy – getting the call. “We like to keep you guys guessing who we’re going to put back there,” center Gabe Ikard said. Yep. More of the same. Nobody loves the SEC like the SEC loves the SEC. Their fans cheer for their conference unlike any other conference does when it comes down to the bowl season. But do any fans of Oklahoma State really want to see the Sooners do well against Alabama? Are there Texas Tech folks who really want the Cowboys to beat Missouri? Well, probably, but the conference allegiance isn’t near as serious. Ikard isn’t the only Sooner who feels that way. The battle between conferences is something for the fans. Stoops didn’t seem to care, despite the fact he took some shots at the SEC before the season started. He wasn’t about to get back into that Monday, though, suggesting another angle would be better idea. We know if Alabama wins, the conference will certainly claim it is as a hearty victory. Seriously doubt the Big 12 will trumpet Oklahoma as a giant slayer if the Sooners are able to get a win. Lots of questions to Stoops Monday about Texas coach Mack Brown, who is resigning after his team plays Oregon in the Alamo Bowl. Lots of talk in the past week about Alabama coach Nick Saban and a possible move to Texas. While there probably won’t be a lot of Mack Brown talk in the near future, I would think there’s going to be plenty of talk about Saban. Done deal that he’s staying at Alabama? Who knows. Meanwhile, Stoops was asked a possible move to Texas. He didn’t say no, but he did distance himself from talking about it. If Texas doesn’t make a move in the next few days, there will be a lot more talk about who might be heading to Austin.